In thinking about innovation, executives would be well served not to focus exclusively on finding talented product design maestros or even process design experts, but rather creative institutional designers who can challenge and re-think their existing institutional arrangements from the ground up. These institutional designers will unlock a steady flow of product and process innovations. Without their help, executives will continue to struggle with isolated innovation initiatives that show great promise at the outset, but rarely deliver on their full potential. Even when the full potential of these initiatives is realized, this potential is inherently limited. Far better to re-think the innovation opportunity at a much more fundamental level – a level that keeps on giving. For those who doubt the power of institutional innovation, reflect on what has been the single most wealth creating innovation over the past several centuries. The steam engine? The telephone? Ford’s assembly line approach to manufacturing? Fuhgeddaboutit. It was the development of the limited liability joint stock company – a profound institutional innovation. This backs up what I’ve been trying to articulate about Design Led Innovation. It can do a whole lot more than just design better looking products. Hagel’s thinking fits rather well with the stuff going on with co-innovation and business network transformation here at SAP (thanks Prashath for an excellent summary of the Sapphire talk). Product centric innovation is simply not enough. At the last Chief HR Officer roundtable we discussed the workforce of the future and design led innovation, so we figured we’d bring these together into a hands-on workshop. . We have put together a hands on workshop on the worker of the future and its impact on HR lead by the DST. It will be held at TeliaSonera in Stockholm on the 28 and 29 of November. TeliaSonera has played a key role in helping us get this together. Event page here and agenda details here. We are expecting roughly 20 folks, and would like participating companies to bring along 2 people -one senior HR person,and a young sparky person just out of University or school. We will also be connecting with the local university to tap into more youthful wisdom. Perhaps we can start to shift the HR institution a bit. Drop me a email or a Tweet if you’d like to know more. I’d been vaguely planning to write a more serious Sapphire tome sometime this week. The prod to do it now, on Sunday evening, came from Inside-IT.ch (a Swiss-online IT magazine). It took a gentle potshot at us bloggers for not being serious enough. Too much talk about ties and pictures of shockhorrorfun on flickr apparently. I was going to respond on the site, but the registration pages put me off. I just want to comment, not move to Switzerland. German speakers can read it here. Much of the blog commentary on the Sapphires has been on the brief sighting of A1S, whether it is market changing , the business model, whether SAP gets SaaS , and what it will cannibalize. This discussion is goodness and I hope those running A1S will read and absorb what’s been written. I’m pleased that Salesforce are dissing us already, this probably means we are doing something right. Other themes – SAP’s “embrace” of social media and blogging received lots of coverage, both from Atlanta and Vienna. SDN especially has received heaps of positive feedback. Harmony and other web 2.0 for the enterprise endeavours are also good news. Lightweight is a word I’d like to hear more of at SAP. Charlie Wood has a super take on Sapphire, thoughtful yet concise. Please Read it. (And if you are a SAP ecosystem guy, Charlie is exactly the sort of chap we need ISVing and making a good living off the SAP platform. At the moment he is doing stuff with salesforce.) Also have a look at Charlie’s post on the Pascal Brosset meeting. But I work for SAP, so what was my take on Sapphire- not purely as a blogger, but as an employee? My day job focuses on the executives at our bigger companies, so fascinating though A1S is, while it remains under the covers and focused on the space between B1 and All in One, it doesn’t impact my 9-5 existence much. So what did I take away from Sapphire to motivate me? What are the things that will drive business this year in my day to day? 1. GRC is rocking. It has moved way beyond SOX, and with the Risk product coming on line this growth will further accelerate. 2. Office of the CFO focus. I’m a huge fan of the non-technical sell. I expect the tuck-in acquisitions of Pilot and Outlooksoft will begin to pay off in q3-q4. As with the Virsa solution, it will take a couple of quarters for the sales force to get on the ball, but once they do, this will ramp up seriously. 3. Microsoft is serious about Duet. 4. 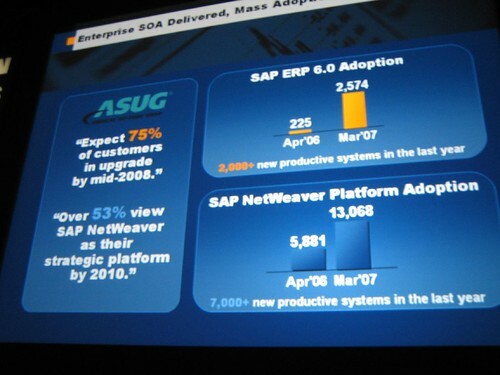 ERP and Netweaver adoption is there for all to see. Both ASUG and DSAG confirm this momentum. The naysayers have been proved wrong on this one. 2,000 new productive systems in year. This means that there are now lots more upgrade references, so this will drive further adoption. The dropping of the that dumb 2005 moniker will cause a little confusion and a ppt find and replace fest here in Walldorf, but I’ most of us are relieved to see it go. Henning Kagermann noted several times that this is the fastest release adoption in SAP’s history. This tells me that the business is healthy. 5. PeopleSoft replacements continuing. I received an RFP from an organization during Sapphire that nearly caused me to fall off my chair. If they want a new HR-payroll, then, gosh. 6. Appliances. Enterprise Search, BI accelerator, and Duet. I need to find out more about these. 7. Endorsed solutions like Ruleburst. I have another post about them in the works. We need to do a better job at helping sell other people’s stuff. So, while much of the hype and ink spillage was on the SME, there is much for us enterprisey types to get on with selling and implementing. The partners I spoke to at Sapphire are all busy. (Well done Axon, btw) There is a healthy buzz in the ERP space. Nobody seems to be sitting around waiting for A1S. But my biggest takeaway remains Hasso’s comment at Atlanta. Here is the clip. This is SAP’s competitive advantage. The best companies in the world run our stuff, and want it to improve it. I’m convinced that much of SAP’s success has been that great companies have bought our stuff, and told us how to make it better. We haven’t always listened, but now, more than ever we need to. Increasingly the future of business is not about internal process improvement, it is about the network. We need to gulp the kool-aid of quality collaboration and co-innovation. Unlike most startups we have customers that lead their industries and trust us. Startups need to guess smart, we just have to ask. Those that think that nothing is happening in ERP miss the significant architectural changes that have taken place over the past few years. 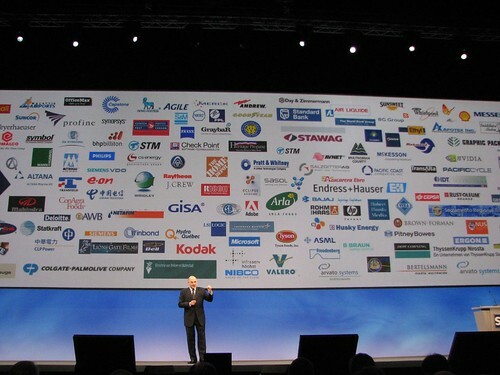 Ask anyone who is building SAP add-ons today compared to 5 years ago. Personally, I’ve never been a huge fan of the term “industry go-to-market”, it tends to drown out the need to focus on the cross-industry processes that are SAP’s bread and butter. But from what I have seen of the Banking Enterprise Services, I’ll probably need to change my mind. Have a look at what the forestry and paper IVN is all about. The enterprise services and the IVN need to get more aligned, I made the same typo as Maggie did and I work here. We need to simplify how we label and explain these concepts. And get them doing this with us. Who knows where this could go? All SAP employees ought to read Sig’s post. He sums up this place better than I can, and I work here. As in few companies, it seems that the “engineering” is still in the driver’s seat. Over the years at SAP I’ve attended a number of Sapphires. In the late nineties I worked on the conference demo floor- a couple times I’ve presented on HR related topics and I’ve also looked after key accounts at the event. My first Sapphire was in Vienna in 1996. The event was mainly in German, with translators. Last year Jeff and Mike kicked off the blogger programme at Sapphire with then novel approach of inviting bloggers to Sapphire, giving them access to executives and so on. It worked well, and the experiment has now grown into a sustained and probably market leading blogger relations programme. The technorati tag sapphire06 is worth a revisit. I’ll kick off my rambling this year’s with the sapphire07 tag in the absence of an alternative naming convention. I’m going to both Sapphires this year as a blogger. I’m really looking forward to it. Craig Cmehil from SDN provides an intro into what we will be up to. I get to meet the folks I’ve only ever met on their blogs and in the Google group torrent. Sure, I’ll be interested in the press conference, the exec briefings, and hearing about new products and business models, but the best thing about Sapphire is talking with customers, partners and colleagues. I hope that my blogger compadres don’t just focus on the SAP executive centre of gravity, but also get out talk with the folks implementing, building but most importantly using the software. It is a customer conference not a financial analyst conference. As a very very very small shareholder I’m marginally interested in revenue projections and so on, but Sapphire is really about the customer. Super though the SAP Colgate story undoubtedly is (and I don’t mean the Wii), there are many other customers doing fabulous stuff with SAP software. The conference theme is co-innovation, and that will be the focus of my blogging efforts. I hope to go on the Coca-Cola visit, as they were one of the first manager self service implementations. I’d like to meet Dave Pendry, whose excellent slides have been a staple of mine for years. I’d like get an update on ADP-SAP global view successes, listen to Rio Tinto, catch up on Duet, ERP upgrades, Muse, GRC, and partner solutions like Ruleburst, and old partner friends like Arinso, Axon and Epi-use. If , dear readers, there is anything you would like me to cover, please drop me a note or leave a comment here. Or even better, if you are there, let’s meet up. I plan to post on both my Vendorprisey blog here and over on SDN-BPX. I might even manage a podcast or two. Watch out Scoble. !-) Craig will no doubt have me twittering, and I reckon the SDN guys will do some funky social media stuff to extend the conversation to the web. Sapphire, though, makes me pause and remember a very dear friend. In 1995 Stephen Lamy and Debra Stracuzzi were developers on the early versions of the SAP HR product. I met them when I was in Walldorf for first time. I was helping to test 3.0A release of R/3. We had dinner together a number of times, mainly at the fabulous Phoenix Chinese restaurant in Wiesloch, near Walldorf. The mix of Paulaner heferweisen and crispy spring rolls rocks. It was Stephen’s and Debra’s passion for SAP and their vision for what SAP HR could become that convinced me to uproot and move me and my then freshly minted good lady to Germany. Stephen remains one of my best friends, even though he is now back in the US (at SAP America). At Sapphire ’98 in Madrid, Debra was presenting on the developments she was working on, when she collapsed on stage and died. Sapphire is tinged with sadness for me and many of us in the SAP HR world. We miss Debra’s intellect, passion, determination, friendship, and her laugh. I’ll be thinking of you and your family, Debra. Author Thomas OtterPosted on April 17, 2007 April 18, 2007 Categories SAP, sapphire075 Comments on SAP Sapphire ponderings.